15 Soldiers of 7th Rangers ambushed and killed by the Enemy. After this tragic incident when 15 soldiers of the 7th Rangers were killed in an ambush, the pressure was very great on all to get "pay back". The follow ups were conducted relentlessly by various sub units of the Seventh Rangers. There were long range fighting patrols, where their fatigues virtually rotted on their bodies, as they spent day in day out in the swamps hunting down the killers. Everyone in Seventh Rangers wanted to very much close up with the enemy and kill them. There was one patrol led by an Officer Commanding, he was Captain Sabdin Ghani. They were airlifted for the follow up to the most likely enemy escape route. They jumped off the hovering helicopter into waist deep brackish and a foul smelling swamp. The helicopter left them there. They started looking for signs of the enemy, soon they came across a trail. They had picked up the fleeing trail of the enemy. They pursued the enemy by day until nightfall, where they continued pursuing the enemy aided by the moonlight in the swamp. They suddenly came upon solid ground, which was covered by "mengkuang" leaves. These large leaves if stepped upon would make a crackling sound. Captain Sabdin Ghani split his men into two groups, one led by himself and the other led by Sergeant Lucas. Sergeant Lucas moved his men into a flanking movement. In the moonlit night at a distance they came upon two huts connected by a walkway. Captain Sabdin's group got on their knees and started crawling, clearing the "mengkuang leaves" so as not to give away their positions. Soon his group started climbing up the huts which were on stilts. The enemy became aware of the presence of the Rangers. The moment the enemy became aware Captain Sabdin Ghani opened up with his Sterling sub machine gun. His group too opened up. The short and fierce encounter resulted in two of the enemy being killed. Another group led by Captain Abdullah of A Company laid a claymore ambush. This was a linear ambush. A group of six of the enemy who were also fleeing walked into the ambush position. One of the enemy realising that they were in an ambush position started stomping his feet into the ground trying to warn the others. The Rangers were not going to let them get away. The person holding the M57 firing device fired the claymore mines. The mines got four of the enemy, two others managed to flee. 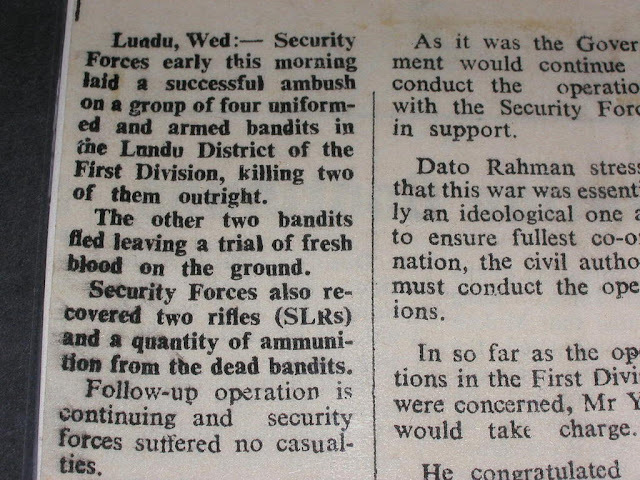 When the clearing patrol, led by Lance Corporal Rahman Putih, saw one of the wounded enemy crawling trying to escape, he was badly wounded at the hip. Lance Corporal Rahman Putih was not feeling merciful that morning, thinking of his 15 dead comrades in arms. He finished off the wounded enemy with a burst from his Sterling sub machine gun. A total of 4 dead enemy were recovered by the clearing patrol.